Trailer: Despicable Me 2 / It's Just Movies Trailer: "Despicable Me 2"
“Despicable Me” wasn’t a movie I sought out necessarily, but I caught it when it was playing on the TV during a party I attended. It was diverting and I kind of enjoyed it, but I don’t really recall much of it. I do remember those little yellow guys, but that also may be because they played a large part of the marketing for the movie – especially after it was released. Before the movie came out, the movie’s ads touted the characters voiced by Steve Carell and Jason Segel. However, the yellow characters (aka the Minions) seemed to be the break-out stars of the flick (much like the penguins in “Madagascar”). Now, the yellow guys are taking center stage right off the bat for the marketing of “Despicable Me.” Not only are the Minions featured in the trailer – their antics make up the entirety of the trailer. I will admit that I didn’t laugh at anything they did in the trailer, but clearly I’m not the target market. I’m pretty sure they younger crowd will at least giggle at the antics of these little guys. 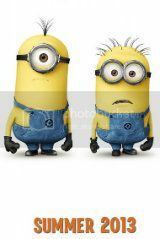 “Despicable Me 2” – which stars the voices of Steve Carell, Kristen Wiig, Miranda Cosgrove, Russell Brand, Steve Coogan and Al Pacino — will be released in theaters July 3, 2013.